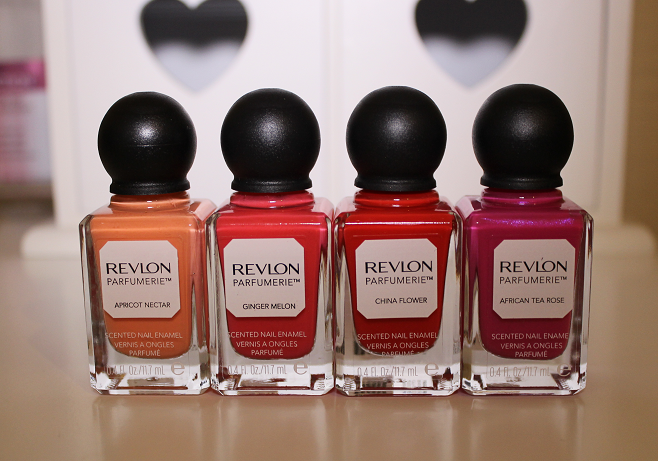 After seeing the Revlon Parfumerie Scented Nail Enamel collection a while ago on some blogs I've been eagerly awaiting their release ever since. The cute little bottles looked very appealing, also I was very intrigued by their varied range of scents and colours. When I stepped into Boots yesterday I was extremely excited to see them in all their glory on the shelves. I'm not sure if my local Boots stocked all 20 polishes as I felt like I picked up most of them but according to the Boots website, the range of 20 is split into the following three categories: Fruit & Floral, Fresh and Sweet & Spicy. See the full range here. They had a 3 for 2 deal on so I ended up choosing 9 polishes. 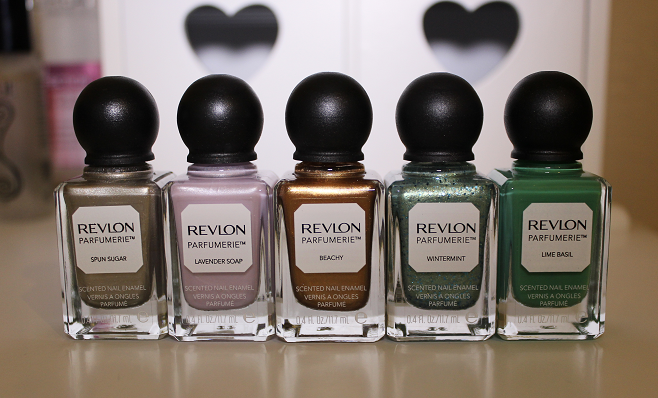 Whilst swatching the shades I was very impressed with the quality of the polishes. They all applied smoothly and evenly and were opaque in two coats. My swatches from left to right are: Spun Sugar, Lavender Soap, Beachy, Wintermint, Lime Basil, Apricot Nectar, Ginger Melon, China Flower and African Tea Rose. I'm loving the different textures as you've got regular polishes (Lime Basil, Apricot Nectar, Ginger Melon, China Flower) along with metallic/shimmery (Spun Sugar, Lavender Soap, Beachy, African Tea Rose) and glitter (Wintermint). There also seems to be shades suitable for all times of the year, although I'm especially loving the brights for Summer! I'm probably lacking in the Autumn/Winter shades but there are lots of those colours within the Sweet & Spicy category. Scent-wise as well as shade-wise, my favourite polishes out of the ones I purchased are all in the Fruit & Floral category and are shown above (plus the Lime Basil one). I love the way each one has a unique scent rather than just smelling the same. The name on the bottle is a definitely a good indicator of the scent too. I can't comment on the longevity of the scent as I haven't tested them enough but I wouldn't mind if the scent didn't last long as I love the colours and formula, the scent is a bonus. I like the delicate metallic shades of Spun Sugar and Lavender Soap and the Beachy shade would be amazing for the Summer, especially if you have a nice tan to go with it. Wintermint is really pretty and I love the fresh minty scent. In case you didn't already know this, I wanted to finish by saying that I'm absolutely loving this collection! The packaging is amazing, I love the colours and the scents are fab too. I'm definitely tempted to pick some more of these up! Which ones do you want to try most? I've seen a mint colour which looks gorgeous!